This tutorial explains the posibilities of freely available worldwide elevation maps for hydraulical and hydrological projects. The data is processed and you will get a preview. 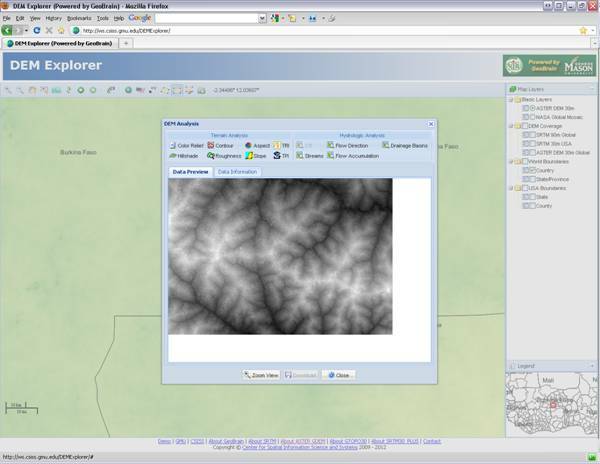 A preview map is generated. 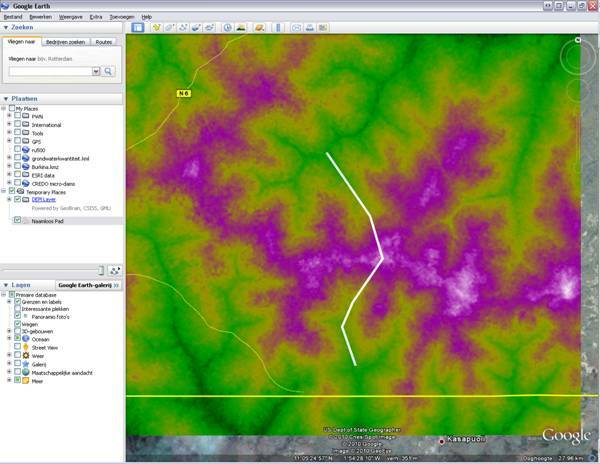 Google Earth will open showing you a Color relief map (purple/white is high, dark green is low). 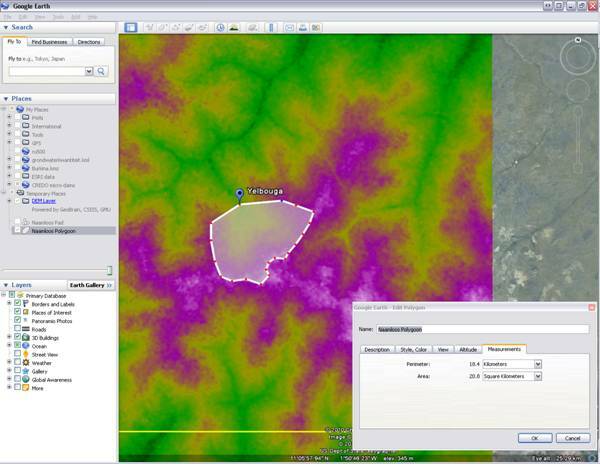 This together with Google Earth’s own elevation tool (move your mouse over the map and in the bottom Google Earth will show the elevation: ) it is possible to determine the catchment boundaries. If you are unsure about a catchment boundary, or you want more information on the elevation, you can draw a line on you map and get the elevation profile along that line. Click to start drawing a line. You can select multiple points on the map to create a line between them. Click “OK” when you are finished. The line will show up on the map. 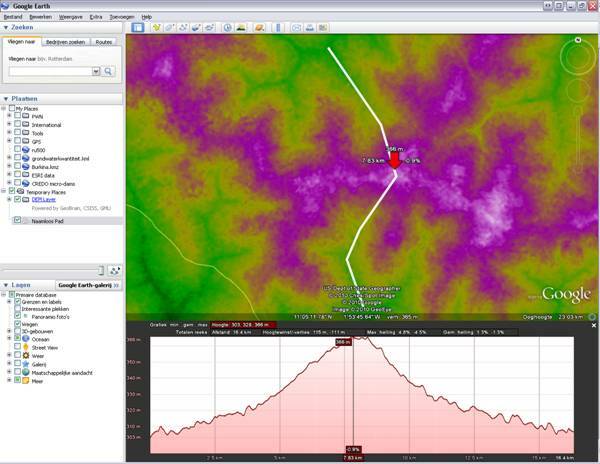 Right-click on the name of the line element in the “Places” panel on the left side of the screen and select “View Elevation Profile”. A profile-view will pop up in the bottom of the window. If you move your mouse around the graph, it will show the exact elevation in the graph and the location on the map is marked by a big red arrow. This graph and the elevations are based on the elevations in Google’s database. Most of the times they correspond with the Aster GDEM data (the data from the color relief map), but it can be different (more or less detailed). 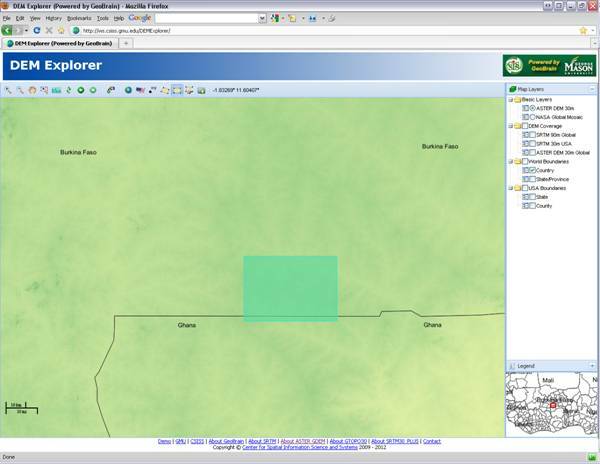 If you have determined the boundaries of the catchment you can draw the catchment into the map by clicking on this button and clicking on the map to draw a polygon of the catchment. 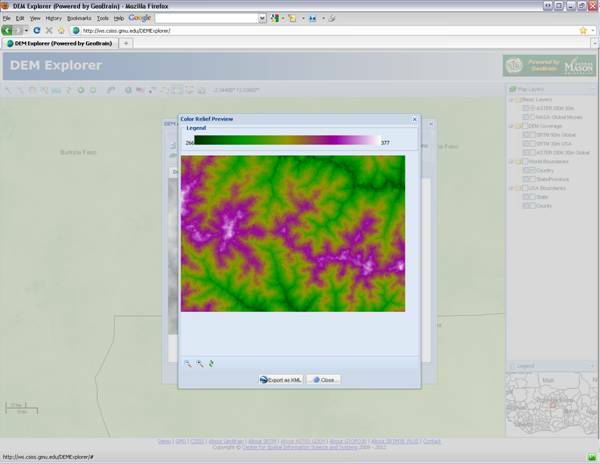 Once you have finished drawing the catchment, click the tab “Measurements” to display the catchment size. Click “OK” to finish the drawing.